'I hope all the companies that are members of AmCham are aware that they are members of an organization that promotes the interests of the tobacco industry at the cost of people’s life and health,' Høie told the Norwegian newspaper Aftenposten. Høie was responding to a June 2015 letter from AmCham Norway urging the government not to move forward with the proposal to require plain packaging for tobacco products. Norway’s legislation follows the lead of Australia, Ireland and the United Kingdom and is expected to be put before Parliament this year. AmCham Norway’s activities surfaced following recent investigative reports by The New York Times that exposed how the U.S. Chamber and its AmCham affiliates have systematically opposed tobacco control measures around the world. In Norway – and many other countries – AmCham ties to the tobacco industry are clear. 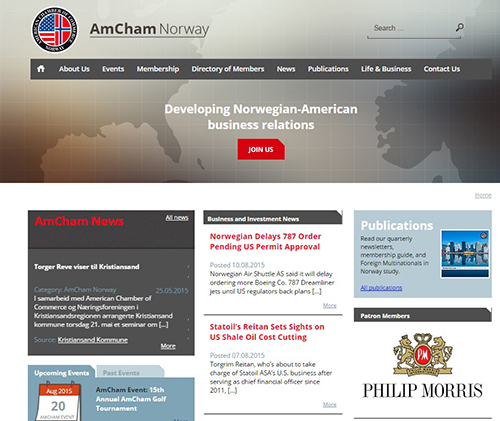 Philip Morris International and British American Tobacco are 'patron members' of AmCham Norway and their logos are featured prominently on the organization’s website. In response to the Times coverage, concerned parties including U.S. corporations, lawmakers and the media acted and spoke up in protest. CVS Health resigned from the U.S. Chamber, and a group of U.S. Senators released a public statement critical of the U.S. Chamber and sent letters to the member companies of the U.S. Chamber’s Board of Directors asking about their positions on the Chamber’s efforts to fight tobacco control measures. In addition, the Campaign for Tobacco-Free Kids and four other leading U.S. public health groups called on members of the Chamber’s board to withdraw from the Chamber unless it stops fighting tobacco control measures. The Campaign for Tobacco-Free Kids also joined several leading international organizations to release Blowing Smoke for Big Tobacco, a report further detailing U.S. Chamber and AmCham efforts to lobby for Big Tobacco around the world. The U.S. Chamber’s lobbying on behalf of the world’s biggest tobacco companies is shown to be a global, systematic pattern of activity. Visit our special report to learn more about the U.S. Chamber of Commerce’s efforts to fight tobacco control measures and read their letters to governments around the world.